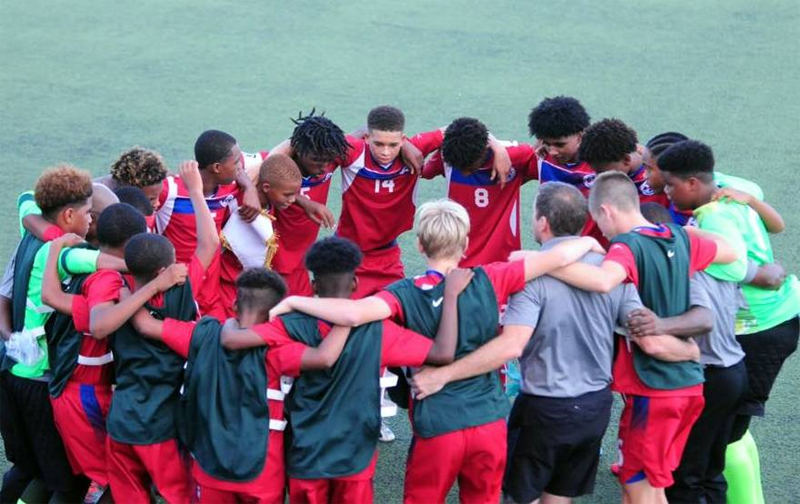 The Bermuda Under 14 National Team took on Cayman Islands in their second game of the 2018 Caribbean Football Union Boys’ U14 Challenge Series, and recorded their second consecutive victory, claiming an emphatic 4 – 0 win. Bermuda’s starting line up included Milai Perott, Naji Bean, Eijaz Shakir, Deniche Hill, Camaje Easton-Smith, Sekai Tatem, Riley Robinson, Harry Twite, Keyni Mills, La Zai Outerbridge, and Sincere Hall, while the substitutes included Toran Place, Zakao Hart, Stefan Jones, Aquiyei Richardson, Ben Osset, and Ahtaio Burgess. Both teams came into the match looking to remain undefeated after winning their opening encounters, and Bermuda pressed early and had the better exchanges early in the match. Bermuda were rewarded for their impressive start when Sincere Hall scored in the seventh minute following one of his mazing runs into the box, Hall raced down the left side of the box before beating three defenders and rounding the keeper to slot the ball into an empty net. Bermuda would go up 2-0 in the 27th minute though an own goal, as Bermuda captain Eijaz Shakir floated a free kick deep into the box and a Cayman Island defender could only manage to head the ball past his own goalkeeper. Bermuda would hold that 2 – 0 lead at the break. Hall would make it 3-0 in the 52nd minute from the penalty spot, Hall went on another impressive run and was fouled by a defender before he could shoot. Hall picked himself up and easily converted his spot kick. Bermuda — who has defeated Cuba in their opening game — will now face the US Virgin Islands on Wednesday. Bermuda has a wealth of talent. We will continue to see and read about many more successes in the future! Go Bermuda and congrats to this dynamic team! Great result and on the heels of the girls. But an important point on youth football. A number of ‘’expat’ kids who have lived in Bermuda for more than a decade, and thus qualify under FIFA laws are not in this squad and would have been. Those kids can go onto play for Bermuda. Bermuda is one more of the only countries in the world to take this stance, why? These are kids. Only cricket and football enforce this – two sports currently in the international wilderness.